The Northumberland Archives, including the Berwick Record Office has been awarded a grant by the Heritage Lottery Fund to find out and make more accessible the archives and information it holds relating to World War I. 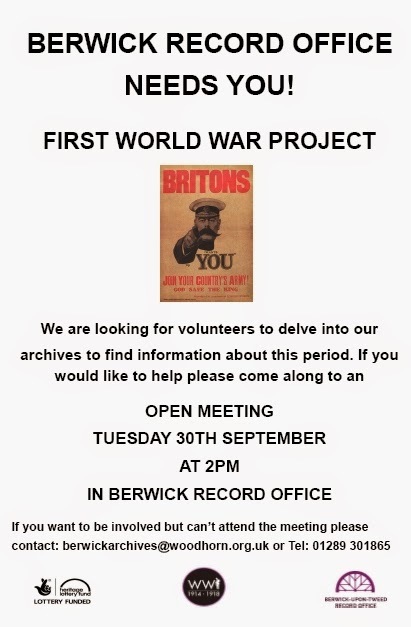 To help them do that, Berwick Record Office is looking for volunteers who want to delve into the archives and find out information about the North Northumberland area and its inhabitants during the First World War. There will be an open meeting in the Berwick Record Office in Wallace Green on Tuesday 30 September at 2pm for anyone interested in finding out more about the project and getting involved. At the meeting, Linda Bankier will talk about the project and what they hope to achieve. For further information or if you would like to be involved but can’t attend, please contact Linda Bankier on berwickarchives@woodhorn.org.uk or phone 01289 301865. The first talk of our 2014/2015 syllabus is on Sunday, 28 September, when we will hear Harry Scott, whose talk is 'The Radio Officers' War '. It takes place at the Corn Exchange and Ormiston Institute, Market Square, Melrose, TD6 9PN. Map. Ian Robert Hendry Waddell, whose home was in Galashiels, was a bright and gifted 20 year old who joined the Merchant Navy in 1940 after qualifying as a Seagoing Radio Officer at Leith Nautical College. In all, he made 14 crossings of the North Atlantic Ocean at a time when German U-boats were sinking a huge amount of Allied shipping. He wrote a series of journals, and wonderfully descriptive and amusing letters, about his life and work at sea. He captured on film the dramatic events as his ship was bombed during the Allied landings in Norway. Ian also described the harrowing scenes, he and his shipmates witnessed, and the danger they faced, as they became involved in the dramatic rescue of the crew of a Royal Navy ship sunk by a U-boat. Radio officers had a lot of responsibility – listening to weather reports, warnings of storms and about enemy shipping, maintaining communication with the outside world, listening for distress calls from other ships. 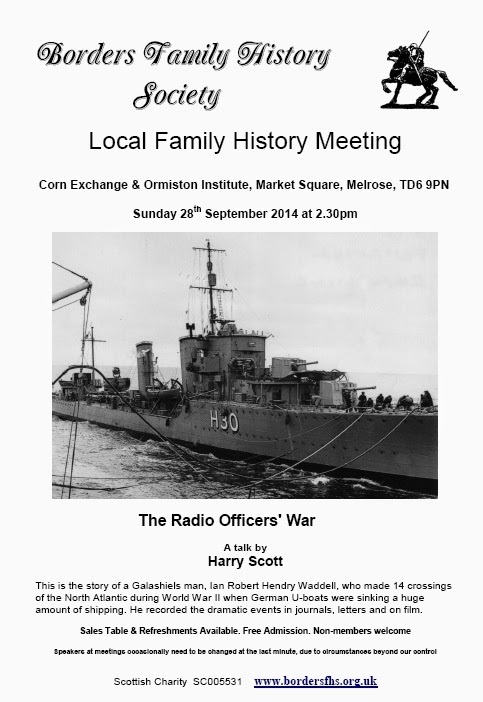 I think you'll find this a very interesting talk whether you're interested in family history, World War II, radio or shipping. I warmly invite you to attend the talk whether you are a member or not. Doors open at 2pm; the talk begins at 2.30pm. It’s free to come in. We'll have a range of family history publications available to buy, and there’ll be light refreshments (donation expected) available after the talk. If you have a problem with your family history, please discuss it (no charge) with one of our volunteers. 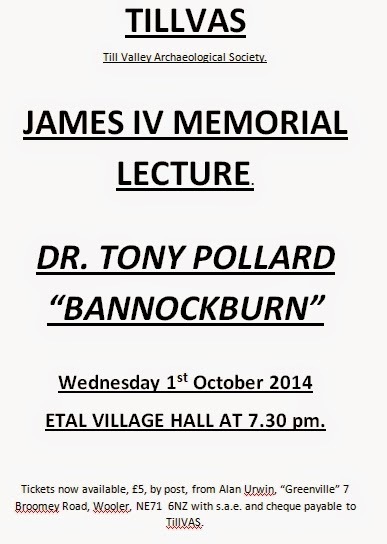 Dr Tony Pollard is giving a lecture about Bannockburn on Wednesday 1st October at Etal Village Hall AT 7.30 pm. I've heard Tony speak on several occasions and he's always given an interesting and absorbing talk. Tickets are £5 each, from Alan Urwin, “Greenville” 7 Broomey Road, Wooler, NE71 6NZ with stamped addressed envelope and cheque payable to TillVAS. 96 pp. Illus. ISBN 978-1-4456-3915-4. Amberley Publishing, 2014. £14.99 plus post and packing. Available from Amberley Publishing, The Hill, Stroud, Gloucestershire, GL5 4EP, England. The book has nicely illustrated card covers. It begins with an introduction to the history of Hawick of almost 2 pages. The following 93 pages comprise clear 'then and now' photographs accompanied by explanatory text, mainly of places in Hawick. There are 8 pages to do with the station and the railway with a fine photograph of the steam engine, Lanarkshire, on its way to Edinburgh in 1959. There are a few pages covering sites outside Hawick, for example Minto House, Denholm, Cavers, and Stobs Camp, the army training ground in both World Wars and a camp for German prisoners-of-war in World War I.
I wouldn't claim to know much about Hawick but I've learnt a lot about Hawick, its buildings and the surrounding countryside from reading the book. 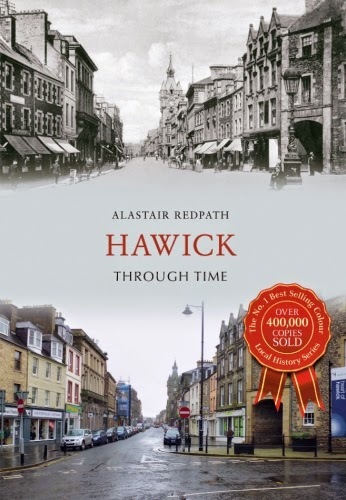 The only drawback is that the author, Alastair Redpath, hasn't included a map of Hawick, so unless you know Hawick well, it will be difficult to understand the lie of the land. I think the book would sell much better with a map and appeal to a much larger audience. Even so, I thoroughly recommend it and it's suitable for young and old alike. I think it should especially appeal to parents who wish to encourage their children to read. It would make a nice Christmas gift, too. If you're not from Hawick, or you haven't been there for a long time, you can see useful maps of Hawick on the National Library's website, for example, John Wood's map of Hawick, 1824, or the 1857-58 Large Scale Town Plan of Hawick. For a scrollable Ordnance Survey map of Hawick and the surrounding countryside, see our Hawick parish page. Hawick Through Time is currently on offer through the publisher at £13.49 including UK post and packing.